As purveyors of salt, we have traveled the world to bring you a top notch culinary experience! Herbs de Provence is a timeless blend inspired by the Southeast of France. To create this blend, we infuse our Pacific Sea Salt with the exquisite flavors of rosemary, thyme, savory, oregano, marjoram, and basil; the result is a salt that smells as good as it tastes! INSPIRED THE HERBS OF PROVENCE, FRANCE - Herbs de Provence is a timeless blend inspired by the herbs of the Southeast of France. To create this aromatic blend, we infuse our Pacific Sea Salt with the exquisite, savory flavors of rosemary, thyme, savory, oregano, marjoram, and basil - the result is a salt that smells as good as it tastes! 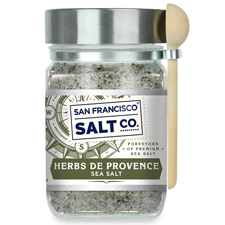 AN ESSENTIAL INGREDIENT FOR PROFESSIONAL & HOME CHEFS ALIKE - An incredibly versatile cooking salt, our Herbs de Provence Sea Salt perfectly complements a variety of foods such as grilled meats, roasted vegetables, stews, sauces, salad dressings, and more! 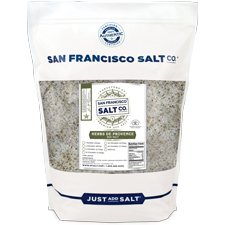 BUY WITH CONFIDENCE - The San Francisco Salt Company is confident that you will be happy with the quality of our products and will stand behind every single item we sell. San Francisco Salt Company has been a trusted supplier of salt since 2002. PROPERTIES - Our Herbs de Provence Sea Salt is Kosher Certified, Non-GMO, and does not contain any MSG, Soy, Gluten, Dairy, anti-caking agents, artificial colors, or additives.